AMSAT has done some of the most exciting stuff in amateur radio today: amateur radio satellites. Yes, amateurs build their own spacecraft and put them in orbit. I've even helped with design, construction, and debug of several spacecraft myself. I was one of the control operators for one of them (AO-16). I established AMSAT's original web pages (replaced by new PHP-based pages in June 2004, and rebuilt again in 2013 using WordPress on a new server), and served as Vice President for Electronic Publication until AMSAT's reorganization of October 2004. The San Diego Packet Radio Association is dead now, but I was involved from start to finish. I served as webmaster for the Palomar Amateur Radio Club, the biggest general-interest amateur radio club in San Diego County, from 2002 through 2016. I'm a member and supporter of ARRL, the national association for amateur radio. I hold an ARRL appointment as Technical Specialist, and serve several times a year as a volunteer examiner. See also my software page. Most of the software I've published is connected to amateur radio. April 1979 Upgraded to General. Bought my first microphone (a beautiful Astatic D-104). June 1979 Upgraded to Advanced. July 1979 Received new callsign, KB5MU. August 1979 Moved to Houston, TX for college. June 1981 Purchased my first 2m FM rig, an ICOM IC-2AT handheld. July 1982 Purchased my first decent HF rig, a Kenwood TS-830S. July 1983 Started into digital communications with an AEA CP-1 computer interface for RTTY using a Commodore VIC-20 computer. I swore to myself that the computer was only for amateur radio. Oh yeah. January 1984 Moved to San Diego, CA for work - apartment bound. Worked mostly 2m FM, including lots of traffic handling on the local net. February 1985 Moved into a house (renting a room). 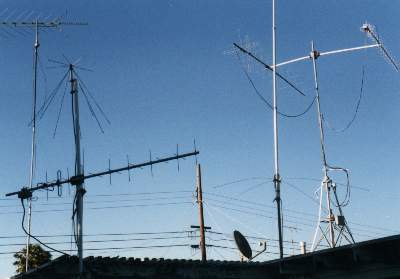 April 1985 Put up an HF antenna again, thanks to a cool landlord. September 1986 Made my first satellite contact via RS-5. March 1988 Made my first packet satellite contact on the FO-12 satellite BBS. October 1990 Bought my first house. Room for antennas! since then... Filled up the house with toys. Not visible is a chimney-mounted 2m/1.25m dual-band vertical. That house is now rented out, so all those antennas are down. The new place is nominally covered by CC&R's that prohibit antennas, but there is no homeowner's association and thus no enforcement. No one has complained about my 43-foot vertical for HF with automatic antenna tuner at the base.